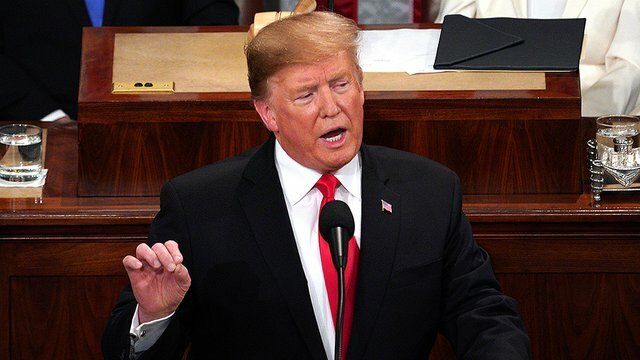 President Trump called on lawmakers during his State of the Union address Tuesday night to ban “late-term” abortions, a policy that won’t pass a divided Congress. “To defend the dignity of every person, I am asking the Congress to pass legislation to prohibit the late-term abortion of children who can feel pain in the mother’s womb,” Trump said during his speech. The White House has said Trump backs legislation that would ban abortions after 20 weeks. Senate Democrats blocked such a measure in January 2018. Trump in his speech referenced bills in Virginia and New York that would ease abortion restrictions, measures that have faced backlash from anti-abortion groups in recent weeks. “Let us work together to build a culture that cherishes innocent life,” Trump said. Planned Parenthood President Leana Wen, a guest of Speaker Nancy Pelosi (D-Calif.), knocked the president’s comments on Twitter. “Restrictions on abortion later in pregnancy prevent health care providers from giving their patients the best care possible. It’s my job to provide my patients with the information they need to make the best decision for themselves. I trust my patients; I trust women,” she tweeted. The New York bill signed into law last month by Gov. Andrew Cuomo (D) allows abortions after 24 weeks if a doctor determines the woman’s life or health is at stake, or if the fetus is not viable. A bill in Virginia would have made it easier for women to get abortions in the third trimester of pregnancy by requiring the approval of only one doctor instead of the three mandated under current law.